I went out today determined to get a photo of an Osprey diving for a fish. I saw three of them catch fish, but each time when I was not in a position to get a photo, so I went to plan B which was to photograph Cormorants catching trout. 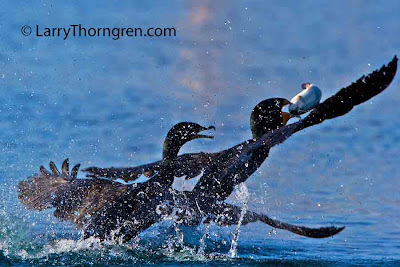 One of these Cormorants has brought a fish to the surface and the other one is determined to steal it. Fishing Pond, Veteran's Memorial Park, Boulder City, Nevada. Canon 20D, 500 mm lens.